A friend of mine was telling me he read in the paper that Alghanim got the Hummer H3 and that they are taking pre-orders. I found that hard to believe since the H3 wasn't out yet in the states yet alone here in Kuwait. 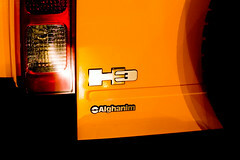 So i decided to go to Alghanim and check it out myself and to my surprise, they have the H3. I don't understand how they have it but they do. Price is around KD14,500 and you can pre-order one today and you might receive it in July. I think the H2 and H1 both look better then the H3. The H3's fenders are really ugly but I am sure once the thing is on the road it will look a lot better.. and once its NOT in yellow. If it was black it would have looked a lot better thats for sure. Anyway today is Day 160 of the project. Funny, the original version of the Hummer looks so crude and box-like compared to these "commercialised" versions targetted at "people who want to stand out". As with all unique cars in Kuwait, they dont stay unique for long. Even Lambo Murcilagos are commmonplace... what still remains rare is the Aston Martin Vanquish, only seen one black/navy one so far. Oh, and the SLR, ive only seen pics on a blog of a silver one on the road. There's an H3 when did that happen? And its not like the H2 looks amazing and is worth making another version. I love the Hummer H1 and I would stick to that, and not get the stupid imitations. But of course its going to be very popular in Kuwait. And seriously, whats with the yellow?? Its really UGLY!